$8000+ powered Viking Reload & much more to be won with Hutchwilco boat show tickets online! People who buy tickets to the 2019 Hutchwilco New Zealand Boat Show online will automatically go into the draw to win a Viking Kayaks ultimate fishing kayak prize package worth over $8000! This prize includes a fully kitted-out Viking Profish Reload, complete with a powerful electric motor, a professionally installed Raymarine Dragonfly 4 PRO multi-function display and much more. 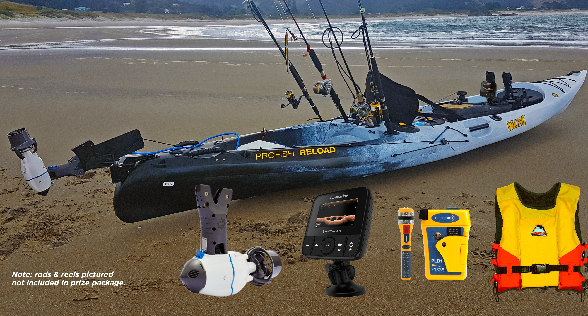 Those who buy tickets to the 2019 Hutchwilco New Zealand Boat Show on-line will go in the draw to win an amazing $8000-plus Viking Profish Reload prize package, complete with a powerful new Bixpy electric motor as well as a Raymarine Dragonfly 4 PRO, loads of extras and a second entry into the show’s Grand Prize draw! The online tickets, which will be on sale on the show’s popular website www.boatshow.co.nz from December 1, are just $20 each. Every online ticket will also include a free bonus second entry into the draw for the show’s must-be-won $200,000-plus Surtees/Yamaha Grand Prize. as well as a second bonus entry into the show’s Grand Prize draw. Viking Kayaks’ managing director, Grant Montague says the person lucky enough to win this incredible online ticket prize will definitely be the envy of their fishing mates. Those planning to buy their online tickets as a Xmas present or stocking filler will also go into the draw to win a Pre-Xmas Bonus Pack worth over $300! The Hutchwilco New Zealand Boat Show will be held at the ASB Showgrounds in Greenlane, Auckland on May 16-19, 2019.